Fancy a last minute break? A week-end away from it all? Then why not visit historic Stratford-upon-Avon? ....or have you left it a little late? 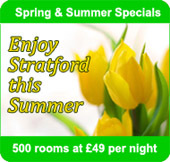 Stratford-upon-Avon provides the perfect venue for a last minute break. Visit mid week or weekends, there is always plenty going on to for everyone. 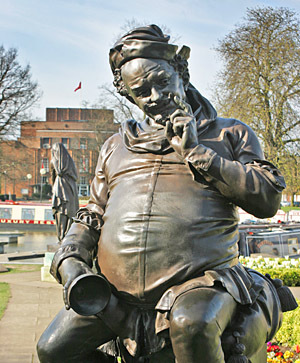 Why not enjoy a visit to the recently redeveloped Royal Shakespeare Theatre, a visit to the Shakespeare Properties plus many more historical buildings. You will find a number of individual shops and restaurants and bars. Take in a riverside walk, a town trail or explore the many villages that surround the beautiful town of Stratford-upon-Avon. Now you have decided to visit us last minute then simply enter the dates you wish to stay over and the number of nights you wish to stay for. You will be presented with a list of the hotels, bed & breakfasts and guest-houses who have availability to suit your dates. So simply contact the accommodation outlet of your choice and look forward to your stay!